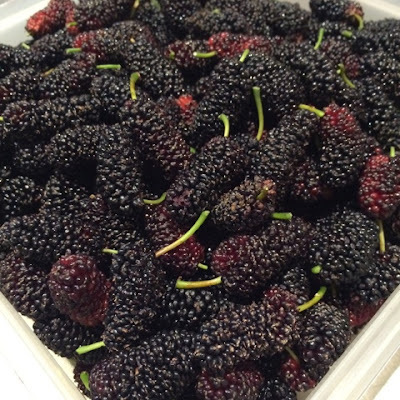 Mulberries are not a fruit that seem to be around or grown commercially but are a fantastic fruit for compotes, jam, ice creams and parfaits. They are intensely coloured and stain everything that they come in contact with, best to wear disposable gloves for picking and processing. My first experience of mulberries had me hooked. It really has been a case of round and round the mulberry tree. My friend Nicole has a large spreading tree that is loaded with fruit. 'Pick as many as you like' she said so I did, two buckets. 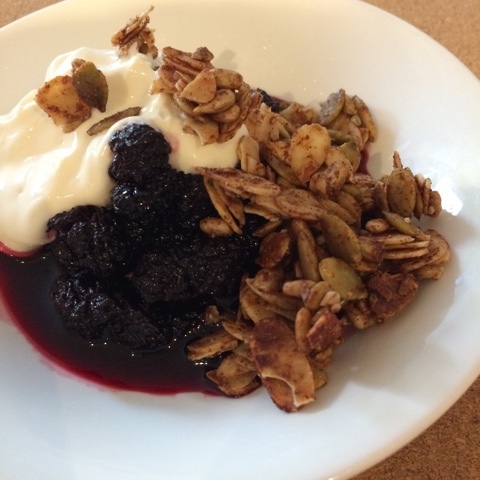 My favourite way to have them is as a compote. The mulberries hold their shape during the cooking process and are tart enough to counteract the sweetness of the syrup. 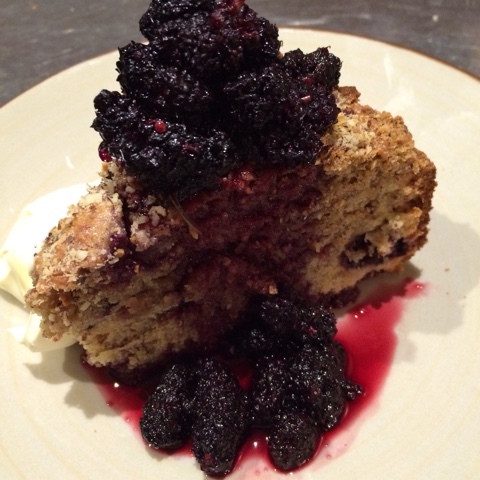 Add a splash of brandy and serve with good vanilla icecream, cream or yoghurt for a delicious dessert. 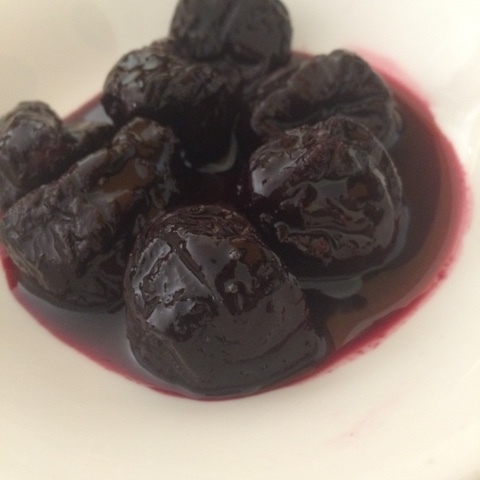 Any leftover syrup is used to stew prunes or rhubarb. The syrup is also good as a topping on icecream. 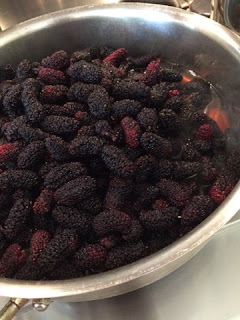 500 g mulberries, stalks snipped off and washed. Place sugar and water in a saucepan. I like to use a shallow pan or deep frypan. 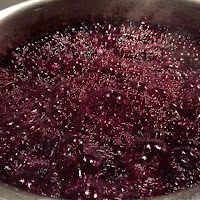 Bring the mixture to the boil, stir to make sure the sugar has dissolved and the simmer until the mixture becomes a little thicker and syrupy. Add prepared mulberries and simmer for five to ten minutes, stirring gently to avoid breaking up the mulberries. 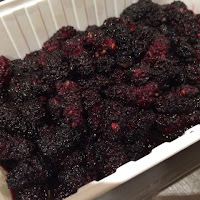 The syrup will become a purple colour as the mulberries release some juice. 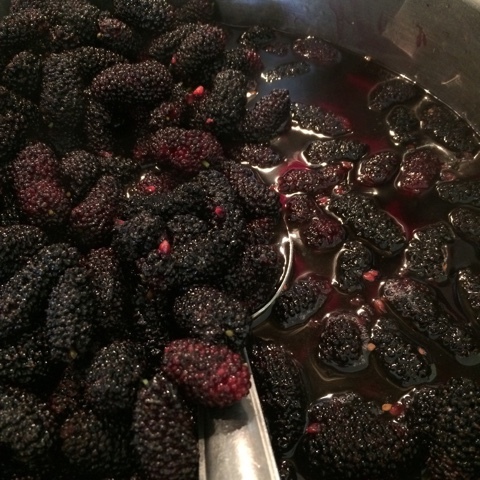 Remove mulberries from the syrup using a slotted spoon. 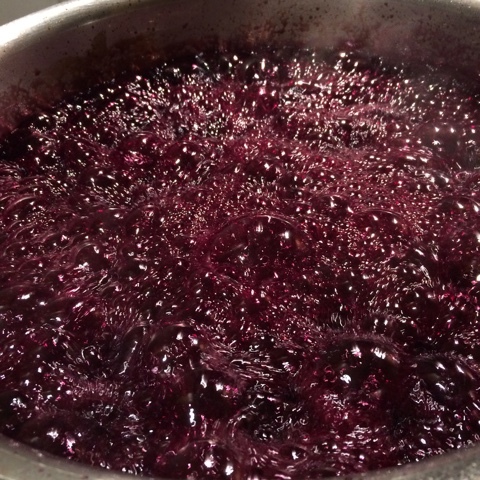 Continue to simmer the syrup until it is quite thick. Add brandy if desired. Pour the hot syrup over the mulberries. Refrigerate in an airtight container.